(Nanowerk News) The signs of climate change are universally evident, but for French winemakers, already feeling the effects of competition from other countries, the year of volatile weather does not bode well. A lot of rain, a late spring and a summer that never arrived have resulted in earlier harvests. This has contributed to grapes with lower acidity and higher sugar content. In other words, higher alcohol and fruitier resulting in cloying wines - with too much residual sugar and not enough acidity to balance the character of the wine. The changing climate has affected the delicate balance of weather, soil and other factors central to the production of wine. Last year saw the smallest harvest in at least 40 years, according to the Agriculture Ministry. The estimate is that overall production is down by 20 % because of the temperamental weather across France. It is believed that if nothing is done to reduce global greenhouse gas emissions, vineyards will be displaced more than 1,000 km beyond their traditional boundaries by the end of this century, jeopardising the wine-growing industry. Already, it is becoming difficult to produce fine wines using the Pinot Noir grape on its traditional territory in Burgundy. But the effects of climate change on wine crops have also been visible around the globe. 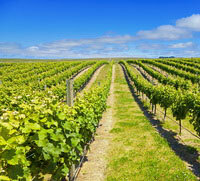 But wine regions can adapt and take on the challenge of global warming by adopting different techniques. These include planting the vines in shallow soil to reduce water consumption, introducing controlled irrigation and shading the grapes from the sun. More drastic measures include large-scale industrial techniques, such as alcohol removal, which is already widely employed in wine regions in Australia, Spain and South Africa. But studies have indicated that climate warming could prove beneficial for some countries previously considered too cold for wine-making, such as Germany and England. It seems that climate change and a taste for 'lighter' wines might hold new promise for Continental European wines.